~ ~ ~Jayne Stamps ~ ~ ~: Button, Button, Who's Got the New Button Buddies set? Button, Button, Who's Got the New Button Buddies set? Do you like buttons? I remember one of my favorite pastimes as a little kid was going through my Grandma's button box. I would pour them all out on the floor and sort through them, setting aside my "favorites". I never took any of the buttons (she might need them for something), but I spent many happy hours at her house just looking at all of the buttons she had. Stampin' Up! 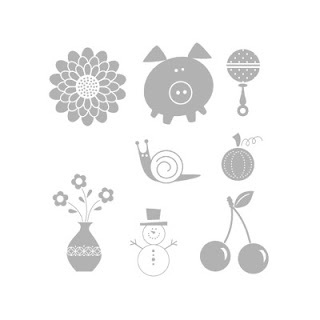 has an adorable stamp set this year designed especially for buttons! When I saw this stamp set in the catalog, I knew I HAD to have it! it's called Button Buddies and is on page 71 of the IB&C. I also love Stampin' Up! 's Designer Buttons. They have such a wonderful variety of colors, sizes, and shapes in all four color families! Check them out on page 197 of the new Idea Book & Catalog. And the price is so reasonable - only $8.95 for a package of 72 buttons! That's only about 12 cents apiece! A pumpkin... A snowman... Plus a few more shapes to use. Even these simple little note cards look so much cuter with buttons added to them, don't you agree? And how simple are these? Button Buddies is a set of 8 stamps, available in wood or clear-mount.